Licensed Practical Nurses are a critical part of the health care team, performing tasks that are imperative for patient care. They check vital signs, dress wounds, install catheters, perform enemas, assist with patient hygiene, administer medication, start IVs, monitor equipment, massage sore muscles, and much more. Their daily responsibilities require constant, intimate contact with patients – LPNs usually have more contact with patients that other members of the medical team. Within the nursing hierarchy, experienced LPNs may supervise CNAs and orderlies, but work under the guidance of registered nurses. Licensure is mandatory for practical nurses in New Mexico. After graduating from an approved training program, graduates may apply for licensure with the New Mexico Board of Nursing. The Board authorizes eligible candidates to take the NCLEX-PN, a rigorous computer-based assessment, which determines their readiness for state licensure. To begin a career as a licensed vocational nurse, you must complete an approved nursing education program at one of New Mexico’s colleges. The certificate program covers classroom, simulation, and clinical learning experiences in preparation for the NCLEX-PN and employment in various healthcare settings. Classroom instruction covers nursing concepts, pharmacology, pediatric nursing, maternal-neonatal nursing, patient care, geriatric nursing and transition to practice. Students must complete the mandatory clinical experiences, under strict supervision, at hospitals and other clinical settings. The clinical experience not only sharpens students’ interpersonal and practical skills but also provides valuable insight into the workings of the healthcare team. Clinical training involves rigorous activities, such as lifting patients, bending, and standing for extended hours, so students must have the physical and mental ability to perform their duties under those conditions. State regulations will require criminal background clearance, immunization, TB testing, liability insurance, physical exam, CPR, and drug screening before commencing the clinical component of the program. When searching for an LPN program, it is important to enroll in an accredited school that meets the Board’s requirements. Review the NMBON list of approved programs and NCLEX-PN pass rates below for guidance. Admission to most programs requires a high school diploma at a minimum. However, a few school districts facilitate LPN training to students in grades 9 to 12. Entry into New Mexico’s 10 approved colleges is a competitive process, which involves a round of interviews, mandatory orientation, letters of recommendation, a pre-admissions exam, and completion of prerequisite courses – chemistry, human anatomy and physiology, general biology, medical terminology, and college composition. Graduates are eligible to take the NCLEX-PN or enroll seamlessly into a degree program to become a Registered Nurses. Graduation from an approved program is necessary for state licensure, but does not guarantee that the Board will issue a license – as the entire process depends on a criminal background clearance and passing the NCLEX in one of four attempts. Duration and Cost of Training: There has never been a better time to enroll in a nursing program to get licensed as a practical nurse. The shortage of healthcare professionals means you can obtain employment within a few months and get a return on your educational investment. At an average cost of $5,500 for tuition, training to become an LPN in New Mexico is cheaper than most states. Financial aid and state funding for nursing education can also help to reduce the total cost of tuition. Even with additional costs for administrative fees, textbooks, lab and clinical supplies, uniform, and insurance, the final cost of training is almost 40 percent cheaper in New Mexico. Training lasts about one year for full-time students. A 12-month program covers core subjects. Students may have to allocate extra time and resources to complete the prerequisite courses. After studying hard and completing the clinical experience at New Mexico’s practical nursing programs, graduates are prepared to take the National Council Licensure Examination (NCLEX examination) or “State Boards.” The exam is a culmination of your studies in preparation for state licensure. It is a test of your knowledge, skills, and ability for competent and safe practice as a Licensed Practical Nurse. All nursing school graduates must take the NCLEX to practice as entry-level nurses in New Mexico and across the U.S. In order to avoid delays and confusion in processing your application, you should submit your application for licensure with the NMBON and register with Pearson Vue immediately after graduation. Pearson Vue will issue the Authorization to Test (ATT) with the Board’s approval. It is important that you read the verification to identify the ATT dates for testing. Also, you must verify the correct spelling of your name, address, and your email and other contact information. It could take up to four weeks to receive the ATT after registration. Schedule and take the test before the ATT expires – an extension is not available. Your nursing school will provide all the knowledge you need to pass the NCLEX; so it is critical that you review your notes. Begin reviewing the material immediately after your final exams and continue daily until the scheduled test date. The Board will provide your results within two to four weeks although they may be available within 48 hours. The notification will indicate your passing score, or a diagnostic profile that outlines your overall performance in each section if you fail the exam. You must wait 45 days before applying to retake the exam – you can retake up to a maximum of four times in New Mexico. To reapply, submit an application for re-examination with the Board (the fee is $60) and another registration with Pearson Vue ($200). It is the practical nurse’s responsibility to obtain a license to practice with the New Mexico Board of Nursing. 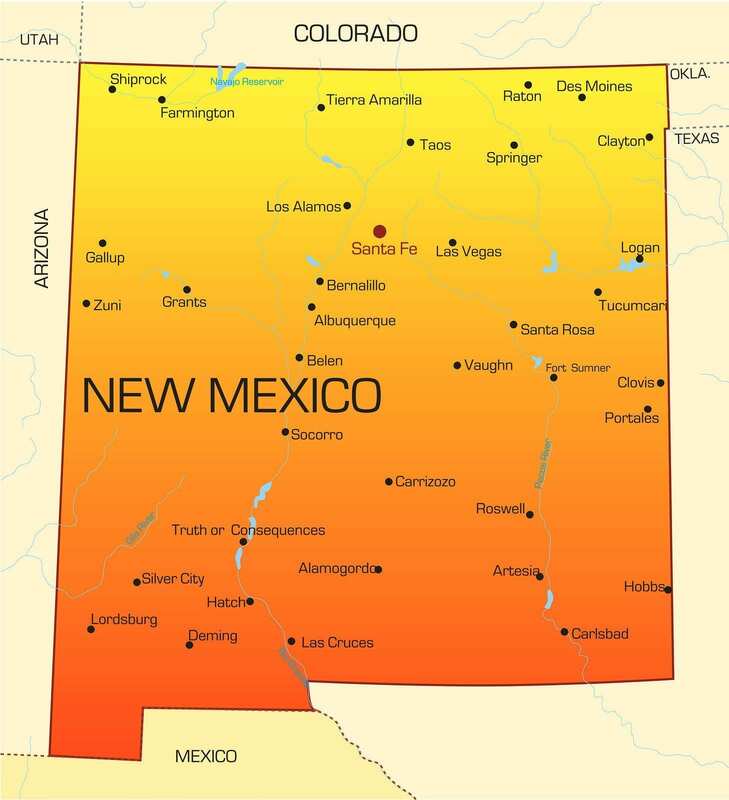 New Mexico is a compact state, so a license is available only to candidates who declare NM as their primary state of residence. Applicants for licensure by exam must complete an accredited nursing education program and receive criminal background clearance to be eligible. LPNs from non-compact states must obtain a license by endorsement or obtain a temporary permit before practicing. Submit a completed licensure by exam Keep a copy of the application for your records and submit the application only after completing the nursing education program. Complete all sections in full and indicate N/A if an item is not applicable. An incomplete application will result in a delay of processing. Enclose the non-refundable initial application fee of $110, payable using a money order, cashier’s check, business check, Demand Draft, or valid credit card. Make arrangements with the registrar’s office to send a certificate of eligibility for graduation or final transcript with degree awarded directly to the Board of Nursing. If you graduated from a non-US nursing education program that is equivalent to an approved program of nursing in the US, you must request an evaluation of educational credentials report from an approved agency. Approved agencies include the Commission on Graduates of Foreign Nursing Schools (CFFNS), International Education Research Foundation (IERF), Josef Sliny & Associates, and Educational Records Evaluation Services Inc. The Agency must send the report directly to the Board. Foreign nurses must also provide a Verification of English Competency report sent from the original source directly to the Board. Acceptable evaluations include TOEFL, TOEIC, and IELTS. Register with Pearson Vue by telephone (1-866-496-2539) or online using a valid credit card. Complete the fingerprint cards and pay for the criminal background check fee. Out-of-state applicants must request fingerprint cards from the Board, complete the fingerprints, and mail the cards directly to 3M Cogent along with the $44 background check processing fee. Disclose any criminal history or disciplinary action on the application and provide certified copies of police records or court documents and an explanatory letter for each “yes” response. Declare your primary state of residence. If you primary residence is in another compact state, you must take the examination in that state. Sign the application and return to the Board with the accompanying documents and application fee. Request special accommodations for the exam if you have a disability as defined by the Americans with Disabilities Act. Request the optional temporary permit and submit the letter of intent to hire from your prospective employer. The Board processes applications in the order they’re received. Notify the Board immediately if your name or address changes while the application is under review. The Board cannot process the application without the results of the criminal records check. If requesting a 6-month graduate nurse permit to practice, your prospective employer must submit a letter of intent to hire on a letterhead. The letter must contain the name of the institution and the supervisor’s name and license number. Processing time for permits to practice is three weeks. Once approved, the Board will issue the permit directly to the New Mexico employer, and you must sign the permit prior to employment as a GPN. The permit becomes void if you fail the exam or fail to take the exam within 6 months after graduation. Your application for licensure will become null and void one year after the Board verifies receipt. If you have a compact state license with multi-state privilege, you may work in New Mexico without applying for licensure. Submit an application for licensure within 90 days if you plan to make New Mexico your primary state of residence. If you’re licensed in a non-compact state and wish to practice in New Mexico, you need to apply for licensure by Endorsement. A completed licensure by endorsement Keep a copy of the application for your records and submit the application only after completing the nursing education program. Complete all sections in full and indicate N/A if an item is not applicable. An incomplete application will result in a delay of processing. The non-refundable initial endorsement fee of $110 payable using a money order, cashier’s check, business check, Demand Draft, or valid credit card. If requesting the temporary permit, the total fee is $160. Graduates of US and foreign nursing programs must confirm their education and passage of the NCLEX-PN. Verification of your license from your original state licensure. The licensing agency must verify your license directly with the New Mexico Board of Nursing: Complete verification through Nursys or the Endorsement Request Form. Fingerprint cards and the criminal background check fee. If you’re not residing in New Mexico at the time of application, you must request fingerprint cards from the Board, complete the fingerprints, and mail the cards directly to 3M Cogent along with the $44 background check processing fee. Certified copies of police records or court documents and an explanatory letter for any criminal history or disciplinary actions. A request for the optional temporary permit – indicate on the application. Remember to declare your primary state of residence, sign the application and return to the Board with the accompanying documents and application fee. You must submit the completed application and fee to qualify for the temporary permit. The non-renewable permit is valid for 6 months and becomes null and void upon the issuance of a current license. New Mexico LPN licenses expire biennially. Working on an expired license is a violation of the nursing practice act. You may send the renewal application by mail or fax not more than 60 days prior to the license expiration. The renewal fee if $93. The fee to reactive a license in lapsed status is $110 for nurses returning to New Mexico. The reactivation fee for a license that was current in the last two years is $200. LPNs must complete 30 hours of continuing education (subject to audit) within the 2-year period. Nationally, careers in healthcare continue to be among those in most demand. As the median age of New Mexico’s population climbs and life expectancy increases, healthcare services will increase in response to the shifts in demographics. Among the fastest-growing disciplines, according to the BLS, is licensed practical and registered nurses. LPNs practice in a variety of settings, including hospitals, clinics, and long-term care facilities. Working under the direct supervision of Registered Nurses, an LPN’s duties can be varied and complex. In New Mexico, initial training and continuing education ensure these nurses acquire the skills and ongoing training to keep up with the evolving healthcare industry and changes in federal and state regulations. The job outlook for LPNs is strong. The BLS projects a 21% growth nationally for the profession from 2010 to 2020, which is well above the 12% average for all occupations. LPNs will be especially needed to care for the increasing number of seniors in need of ongoing health care services. The average annual wage for LPNs in New Mexico was $41,340 in May 2014, according to the BLS. For experienced LPNs, the average salary was up to $46,640. A number of factors affect the salary potential and job opportunities, such as the candidate’s education, professional experience, and location – LPNs in metropolitan cities typically earn more than those in rural areas. Apart from the basic education, employers expect prospective employees to possess technical capabilities, including sound judgment, communication, and interpersonal skills. LPNs can work their way up to other careers in health with a combination of additional education and supervisory experience. I thought Lpn programs had been phased out. When in Los Alamos Nm? Hospitals in Las Cruces are hiring LPN’s. Nursing homes and clinics are the only ones hiring LPN’s in Albuquerque. Go the extra mile and get your associates, but then hospitals are now requiring you have a bachelors or are at least in school for it.